We have made a big change in the insights page of the Adobe Stock Contributor Portal. You can now see the total earnings per image for any specified date range. The top sellers will show up by default. Change the date range to see how much individual images have earned for you during that time. To see the current sales and commissions as you are used to seeing them simply click "activity" in the drop down menu of options. We hope you like this change. More to come! This is a wonderful new feature, Mat, because we do need to be able to see which images are our top earners. Thanks for advocating on our behalf to get it! I will make one suggestion, though. It would be nicer if *activity* was the default feature that shows up, rather than having to use the drop-down list to find it each time we visit that page. My AS bookmark is set to the Insights page. When I go there it's almost always because I want to see my latest sales, which used to show up automatically because they were at the top of the drop-down list, not at the bottom. Could you use your magic touch to make it work that way again? Also, don't forget the search inside portfolio. Now, every time hat I open my insight page it shows me "Top Sellers" as default. Even if I change it to "Activity" then reopening the page it turns to "Top Sellers"
Why Adobe should impose me to see what I don't want to see and does not let me the possibility to save my view preferences in a cookie?? Does this work for video? Yes it does, very nice feature! Thanks, a nice feature. It would be nice if it also said how many times they had been sold next to the $ amount. I dont understand how Fotolia managed to go from best contributor interface in microstock to the worst. New doesn't mean better. Can't find sh1at on this new adobe stock, totaly unnavigaable. Where the h3II do I find latest download, for example. certainly not how I'd set it up, but at least you can find the information somewhere. Thanks, such an annoying interface. Thanks for the feedback everyone. Your comments have been noted and I'll be sure to share them with the development team. This is my preferred view when I go to the site. On a daily basis I want to see my latest sales, and on occasion other type of statistics. Because of the change I have returned to the Fotolia site despite the abusive imposition of a new login on every visit, despite the change is still months away. As others have mentioned, the Adobe site is terrible. Really confusing to navigate and unappealing. The Fotolia site is superior by far. The thing i want to see when i click on a site is my current months earnings - that's what i track. Not the last week or 10 days or last 30 days. I don't need my all time earnings- i know that. Then i want an easy way to see todays sales followed by an easy link to my image all time stats. I don't want to have have to select random date ranges and frankly I don't care about charts and graphs. What part of keeing it simple and sensible is so hard for sites to understand. That's what I wrote earlier today. I go to Adobe Stock to see my latest sales, and I bet everyone else does too. That should be the automatic default setting. Not cool to have to jump through hoops just to find the basic stuff. Definitely, it's helpful to be able to check to see which images have sold the most/best, but since that's not likely to change very often, it's not the most immediately interesting or useful data. Thanks for everyone. Your comments have been noted and I'll be sure to share them with the development team. I hope you can help the development team figure out what we contributors need in this site. Doesn't seem like it should be this hard. I go to Adobe Stock to see my latest sales, and I bet everyone else does too. My vote for default view would be Earnings. From time to time, I dig in to look at trends, but when I'm compulsively checking in throughout the day, I want to see how much money I've made. It is helpful, but really not my first priority. I need a simple page like on fotolia where I can easily see a list of all my files, plus I want to able to do a an easy keyword search on my portfolio. If you then gave me not just a list of files but a total income on that keyword...that would be very useful and help me to see trends better. Although the Adobe site is visually more pleasing it is simply not very practical and the upload and file mangement is much slower than on Fotolia or Shutterstock. And like others have said, I want my page to be first, not a general bestseller page of other people. That should be optional. I will continue to prefer te fotolia page. Maybe consider to keep it open longer for us until Adobe catches up with our needs. No need to ask Matt to change the order/priority : simply go to your ACTIVITY page with a few clicks, then COPY the entire URL, and change your bookmark into this URL. Finished. I don't have to navigate to activity anymore, it's always there. Does not work here, it always returns to the Top Sellers. you called the feature "lifetime earnings" but by default only the earnings of the last 3 months are displayed. That makes no sense! It´s good that you can set a date range but that should be optional - the default should be "all time". Also to get the full picture I now have to go to "dashboard" to see how often my bestsellers sold and to "insights" to see how much they earned. Couldn´t that be implemented on ONE page? I'm going to use the Fotolia interface until the very last second Easy to see my sales, my earnings, upload, attach releases, etc. I tried that before too, with Safari, Chrome and Firefox. But when you look at that page, don't you also see your earnings in the chart at the top of the page? I do. What is your configuration (computer - system - browser)? Lifetime Downloads & Lifetime Earnings on top left. 90 days (last quarter) on left, the 90 days graph, by weeks, with earnings and downloads for the period. On right below: images in order from last sold, on down, by date. It's the My Statistics page. I don't know why it wouldn't show for someone? Firefox, Chrome, Edge, worked on all of them. Drop Down... is in upper left, select data type. I prefer by default to be shown Activity, not Top sellers as i know which they are and they're not changing every day. So if i need several times per month or week i can simply filter Top sellers, but what i check every day is Activity. I do too, but today, after updating my computer (whole long story, no one cares...) I now see this? I don't remember all these choices before. 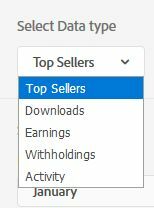 I was happy to see top sellers lists files by total income. Activity just reinforces what I get in the emails, or I can look back at the week. Thanks everyone for the feedback you have provided. We have been discussing ways to make the portal more intuitive and as easy as possible to navigate and to get the information you want. A top feature for years has been for the aggregate total of earnings for individual assets. With the new feature added we have provided that information but understand that as a result it created an extra navigation burden to you. I want to keep you in the loop on what we are working on right now. In the not-too-distant future, when you navigate to the insights page and select a drop down option you will not have to click the "display statistics" button. The new data will automatically populate when you select the option you want. The display statistics button will remain a click requirement when you change the date range. In addition, the system will remember what you last viewed and will set that as your default each time you visit the insights page. If you are looking at the current activity when you close out the page, the activity stats will be the default the next time you visit. I don't have an exact timeline for you but I can assure you this is a priority. I'll keep you updated as I learn more. Thanks everyone for you have provided. We have been discussing ways to make the portal more intuitive and as easy as possible to navigate and to get the information you want. Thanks Mat.... would it also be possible for the number of downloads to be displayed along with the Earnings for each file? Also, keyword/s used to find the file would also be very useful..... thanks for the keeping us updated! This is a nice feature thanks! It would also be useful to see for a give image what search keywords were used that led to actual downloads. What about the range date? It will be nice to have automatically a range date from the first of the month to the date of the current day. I dont need "slider_arrow" to choose one of the Time frame options. But there is a small bug on the activity CSV export: only the currently viewed page (~ 50 lines) is exported, instead of the full data. It's normal to have pagination for the browser view, but export is usually expected to be on the whole data. May be it was there before, but I noticed only today that there is new indicator POSITION on header next to lifetime downloads and earnings. Really curious how that is calculated, as it differs a bit of what was my weekly rank in Fotolia. I believe this position is based on the all time earnings. On Fotolia, both the all time position and the weekly position were displayed. The one on Adobe is closer to my all time earning position. Thanks I always wondered what that was. You can select the timeframe (all time or weekly, for year or month no position is shown) on the drop down menu on the left of the screen. I thinnk this is exactly the old Fotolia rank. Thanks, dirkr! That's exactly right, they match Fotolia's ranks, I didn't notice the drop-down, my bad! It would be great if some of the information now being displayed on Adobe's contributor interface could be better consolidated so you didn't have to visit multiple pages (insights & dashboard) and didn't have to see only one piece of information at a time - for example, being able to see your weekly and all time rank at once; being able to see both downloads and earnings in adjacent columns in any of the earnings charts. Having controls to choose timeframes is nice, but getting a good overview in one screen, at one time so you can check in and then go do something else useful is really more important, IMO. I gave this feedback in the survey too. I can't see any benefit at all of having the rank on the dashboard page and the other earnings information on the insights page - in other words it seems like a no brainer to put all the earnings information together rather than some sort of hard-to-manage tradeoff. It is nice to see work being done on the contributor interface, but a bit disheartening to see the rather haphazard approach to UI design and workflow when using it. You can see also the weekly position, if you select weekly from the drop down menu. Edit: sorry I didn't notice the same answer given above.